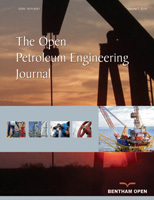 Guest Editors who wish to submit an issue proposal to The Open Petroleum Engineering Journal are requested to complete the following online form. The proposal of thematic issue will then be immediately forwarded to the Editor-in-Chief/Co-Editors/Executive Editor(s) of The Open Petroleum Engineering Journal who will then inform Guest Editors with a decision about the submitted proposal. "I have to express my sincere appreciation for your hard and professional work. Thank you very much!" "My experiences in publishing a paper with Bentham Open is good. I must say that the speed of publication in The Open Petroleum Engineering Journal is very fast. It takes only two month for the pioneer reviewing process. The delay was caused by me. And what’s more, the publisher’s office is quite helpful. I guess they are dealing with thousands emails every week, but they process my request in a very short period of time."